You don’t need a recipe to make this, so although one appears below, please take it for what it is: a scant outline rather than a strict procedure. Besides, it goes against the spirit of running up these flatbread pizzas to be too prescriptive. They are, by nature, rustically messy, and the more freeform and off-the-cuff you make them, the better they will be. I call this one my antipasto pizza because most of its ingredients come from the deli, or at least the deli aisle of the supermarket. In reality, it’s an incredibly useful way of using up a few leftover bits and pieces that have taken up residence in my fridge door. The combination of preserved artichoke hearts, sundried tomatoes and salami – the spicier the better, in my opinion – is nicely balanced, and you only needs scraps of each to make it. You can see that the addition of black olives or even anchovies, if you like them and have them to hand, would be good here, too. Use the flatbread of your choice – and there are so many that are readily available now. My current favourite is Afghan bread, though Turkish pide, naan, khubz and lavash will all get a run if they’re around. Place the flatbread on a baking sheet. Spread the pesto over the flatbread, right to edges, using a pastry brush or the back of a spoon. Scatter over most of the mozzarella. 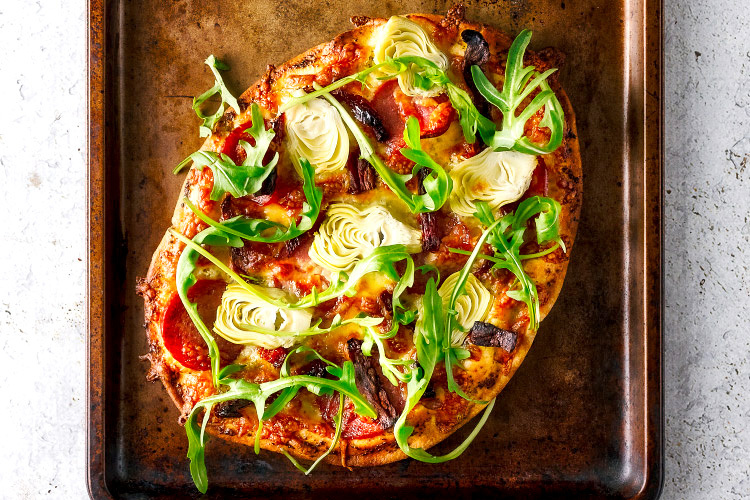 Distribute the artichoke hearts, salami and pieces of sundried tomato on your pizza – artfully, casually, it's up to you. Scatter over the remaining cheese. Place in the oven for 5 minutes or until the cheese has melted and everything is warmed through. Throw some rocket leaves on it (if using), slice up and serve.